Tankless water heaters have now become a popular choice for many households. It is already frequently used in the United Kingdom due to its high performance, lower operating cost, and efficiency. If you haven’t considered switching to a tankless water heater, consider the benefits and how this unit could reduce your utility payments every month. Water heating accounts for about 14 percent of the average U.S. household energy budget, removing the requirement of keeping stand-by water warm in your traditional water heater results in significant savings. So if you replace your old water heater with a tankless water heater, you will cut ten to twenty percent off your energy bill. The total savings will depend on your overall hot water usage and the pre-set temperature you desire. The first thing that you will learn is that the tankless system requires much less space than a traditional water heater. That big tank in your basement that holds the hot water will no longer be necessary. The system is mounted on a wall in your basement and takes up no floor space at all. Some systems can be installed in the place where the hot water is needed and others that heat all of the water in your home from one location. When the water is stored in a tank for later usage, one function that traditional water heaters must continually do is keep the water heater it’s required. This continuous application of energy to the stored water and the associated loss of heat in the tank is what makes tank-type water heaters so inefficient. By providing water at a pre-set temperature only when needed, tankless water heaters provide you hot water without storing it ahead of time. With a heating device activated by the flow of water, the tankless system provides a constant flow of hot water when needed. To heat the water, you have the choices of electricity, gas, and propane. The maximum amount of hot water provided the desired temperature will be restricted by the capacity of the water heater. Gas tankless water heaters have more capacity than electric ones, but your local plumber will be able to help you determine which form of heat is most appropriate for your needs. Whole house water heating needs will require a larger unit which your local plumber will install in the same space as your old water heater. For smaller applications, like point-of-use, the unit will be located in a nearby cabinet or under the sink where the hot water is going to be dispensed. Depending on the temperature rise needed at the point of use will determine how large a unit is required. Some tankless systems will also have a feature that allows you to control how much water is delivered at the desired temperature. 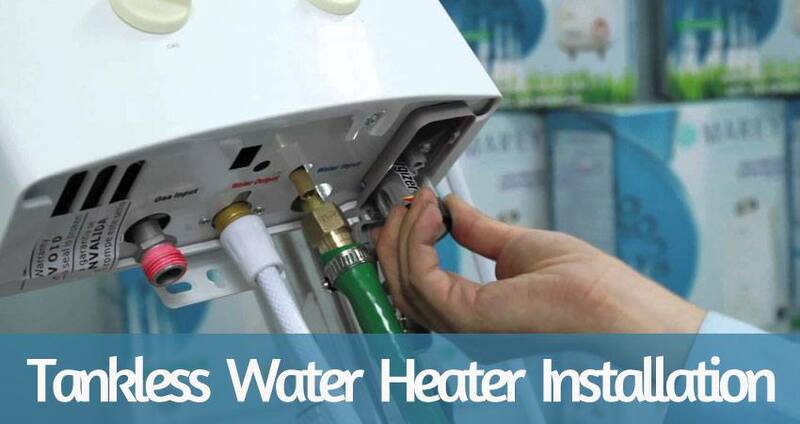 It will be better to use a gas tankless water heater for a whole house application. That’s because they can supply more than 5 gallons per minute at your desired temperature versus 3 gallons per minute for electric. The sealed combustion chamber in a gas tankless water heater will provide additional energy savings when compared to old water heaters. Because older gas water heaters have open draft combustion, chamber much of their energy is lost to the open air. The sealed chamber in the tankless system prevents this. Additional savings and improved environmental impacts will be determined by the set temperature you desire and the amount of hot water you use. If you are installing a new tankless system in your existing home, there are a few required changes that will add to the complexity of the transition. There may be added wiring required for electric tankless water heater systems, and you made need to make changes to your electrical panel. Gas systems may require direct-venting which can bring fresh air from the outside directly to the combustion chamber and vent the flue gas back out. So installation costs of a new tankless system will be 2 to 4 times higher than a regular water heater installation, but you will recoup this additional investment in only a few months due to reduced energy costs. The best time to implement a tankless water heater system is during new construction or a remodel. This is why new construction is the best time to install a tankless water heater system-either gas or electric. Warranties are typically twice as long for tankless water heaters when compared to standard tank-type water heaters. The operating life, for example, is expected to be 20 years or more as opposed to 7 to 10 years for the older type of water heater. The service life is longer because there is no tank and therefore no corrosion in the tank. The electrolytic reaction that occurs in tank-type water heaters is a result of the pH of your tap water. Whether more acidic or more neutral, it will have chemical properties necessary to set up the electrolytic reaction that will corrode the heating element and other features over time. Tankless water heaters provide many benefits to their owners including lower energy costs and longer service life. While the upfront costs will be higher, the total cost of operating the tankless system over its life will be much lower than a standard tank-type system. Talk with your local plumber to get a better understanding of how a tankless water heating system can benefit you. When you are using an on-demand system, you will find that if the right components are added, you will receive your hot water right away. You will not have to wait for the hot water to arrive at the faucet where you are using it. This will mean savings on your water bill every month too. It is only a wise idea to contact a good professional plumbing company just for this project. The explanation is is that there exist picks to consider. Whether you choose gas or electric, you would like an expert plumber to advise and install, the water heater of your choosing. It’s not a good idea to make it a do-it-yourself project, consult with a professional plumber for the best results.